Modern can feel overwhelming at times, especially for newcomers. There are dozens of good decks, each with their own suite of unique and powerful spells. And while it would be nice to own every card ever printed, that's not a realistic goal for most of us. What's an aspiring Modern mage to do? I recommend starting with the staples. These are the cards that are good in multiple decks, allowing you to have the most flexibility when deck building. Acquire these cards whenever possible. Tuck them away in a box or favorite binder. Sing them lullabies (optional). Watch as your ability to play different decks begins to grow. Curious about what my Modern box looks like? Here are five cards of each color (plus colorless, multicolored, and lands) that make up the centerpiece of my collection. If you're in the market for a good list of Modern staples, look no further. The best unconditional removal spell in the format—period. One of white's strengths is the ability to sideboard in cards that can disrupt an opposing game plan. Leyline of Sanctity works wonders against Burn decks while Stony Silence is difficult for Affinity to beat. Thalia slows down control, frustrates combo, and allows you to attack or block with a fairly efficient creature in the meantime. Pair your white with a little bit of black and suddenly you have access to one of the most efficient creature generators in the game. Not only does Lingering Souls give you four 1/1 fliers, it allows you to pay for them with a handy installment plan. 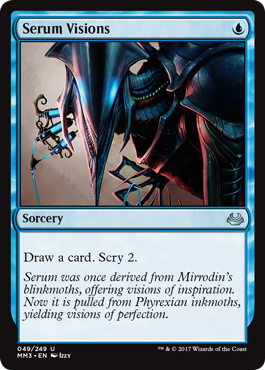 Serum Visions doesn't look like much at first glance, but the fact that it replaces itself while allowing you to manipulate the top of your library makes it a powerful card that is good in all stages of the game. My favorite counterspell of all time. You'll need to run a lot of blue sources before you can cast Cryptic Command with any sort of regularity, but the payoff is massive. 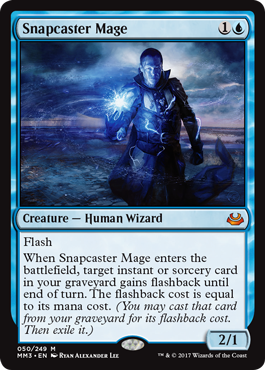 It's the combination of efficiency and flexibility that makes Snapcaster Mage one of the best creatures ever printed. Who doesn't want to rebuy their best spell while increasing their board presence? Blue decks have to win the game eventually, and Delver of Secrets provides an easy-to-cast win condition for spell-heavy decks. For best results, combine with Young Pyromancer and a whole bunch of instants and sorceries. Like Delver of Secrets, Vendilion Clique is good in traditional control decks as well as the more tempo-based brews. Don't forget that you can use the ability on yourself if you need to. Need to build up your board while continuing to draw cards? Dark Confidant is what you want. It's at its best in decks like Abzan and Jund with lots of small, efficient creatures and removal spells. Sometimes, the best way to deal with a threat is to make sure it can't be cast in the first place. Both of these cards are at their best against combo decks, but they're still very good versus midrange and control. That's right—one of the strongest cards in Aether Revolt has already become a Modern staple. Triggering revolt is particularly easy in this format thanks to the prevalence of fetch lands. Planeswalkers aren't as common in Modern as they are in Standard, but Liliana of the Veil is a glaring exception. Liliana is so versatile that she shows up in aggressive decks like Death's Shadow, midrange decks like Abzan, and control decks like 8-Rack. Lightning Bolt has been amazing in every format where it has ever been legal, and Modern is no exception. In fact, this might be the most-played card in the whole format. Another powerful sideboard card, Anger of the Gods is a powerful answer to Infect and the format's other elite aggro decks. 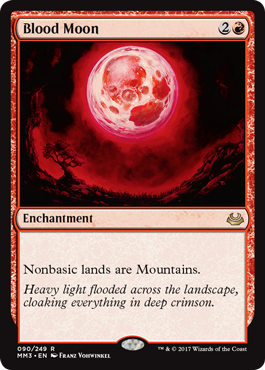 Most Modern mana bases have a lot of nonbasic lands, which means that a well-timed Blood Moon can lock your opponent out of the game entirely. Just make sure that your own mana base is ready to take advantage of the opportunity! Red mages tend to be at their happiest when they're attacking on turn one, and these are the two best aggressive creatures in the format. Throw in Eidolon of the Great Revel and your opponent will barely have time to breathe. I'm not sure what a better creature would even look like. 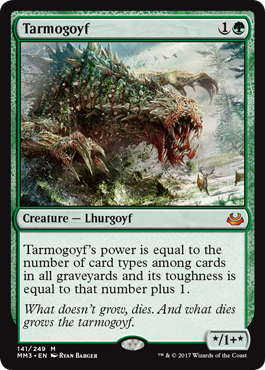 If you've seen Tarmogoyf in action, you know just how quickly it can get out of hand. Noble Hierarch is Modern's premier mana Elf, providing fixing and acceleration combined with a significant combat advantage. This is especially important in decks like Infect that often rely on a single large attacker. Primarily used alongside Valakut, the Molten Pinnacle in combo decks, Primeval Titan is powerful enough to show up in the current iterations of Amulet Bloom as well. Graveyard decks are very powerful at the moment, and this is one of the best ways to stop them. 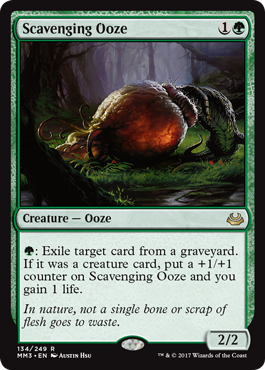 Unlike most hate cards, Scavenging Ooze can grow large enough to take over a game even when your opponent isn't playing out of their 'yard. Not only can Ancient Stirrings find your powerful artifacts in decks like Lantern Control and Tron, it's a cheap and efficient way to dig for all your Eldrazi. A must-play in any deck with green mana and colorless cards. A fantastic catch-all sideboard card that can protect your key creatures, deflect removal spells, and even prevent your opponents from using pump spells. Much like Blood Moon, a well-placed Chalice can completely lock some decks out of the game. It's especially good against Burn, Storm, Infect, Delver, Soul Sisters, and many other decks that rely on one-drop spells. Engineered Explosives gives blue access to mass removal, can wipe out an entire board full of tokens for just two mana, gives control decks an answer to Blood Moon, and so much more. If you can get to seven mana, Karn Liberated is probably going to take over the game. Removal attached to a powerful win condition? Yes, please! You could stick Reality Smasher in this slot as well, but the truth is that there are enough unique Eldrazi decks to make Thought-Knot Seer a true format staple. Even with Eye of Ugin banned, this Oath of the Gatewatch card packs enough of a punch to be one of the most-played creatures in the entire format. You might have noticed a pattern: all of the best Modern staples are cheap to cast and extremely versatile. Kolaghan's Command is no exception, which is why it sees play in Jund, Death's Shadow, and multiple flavors of Grixis. 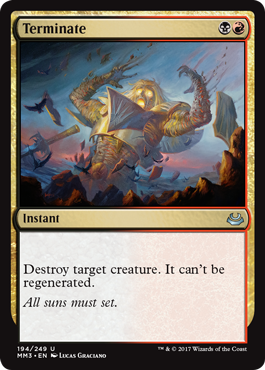 The only thing keeping Terminate from being the best removal spell in Modern is the slightly restrictive casting cost. If you can play it in your deck, you probably should. Some red decks will splash white just to have access to Boros Charm. 4 damage for two mana is such a good deal, especially when combined with other burn spells. Fulminator Mage has quietly become one of the most-played cards in Modern, appearing in everything from Abzan Midrange to Grixis Control to Skred Red. Whenever I'm playing an aggressive deck, I hate to see a Kitchen Finks across the table from me. That it can gain 4 life while blocking two creatures makes it one of the best anti-aggro cards in the format. Bread and butter. Macaroni and cheese. Hall and Oates. Shocks and fetches. This last partnership is the key to having great mana in Modern, and the majority of your mana bases should begin here. 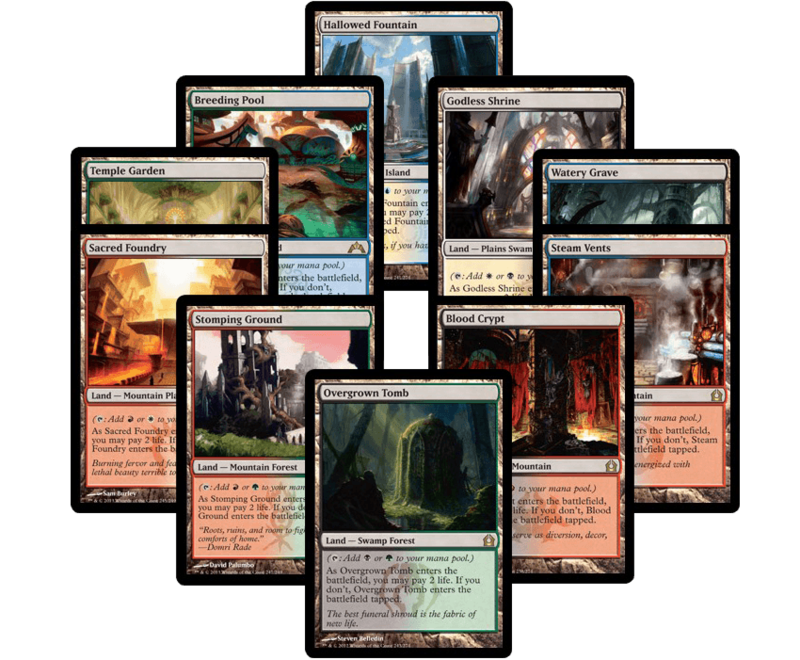 Modern doesn't get Strip Mine or Wasteland, but Ghost Quarter is still a great way to get rid of opposing creature lands. Inkmoth Nexus is obviously important to Infect decks, but don't forget that this land becomes an artifact creature when you activate it. Affinity decks love Inkmoth Nexus as well, and it's occasionally used as a win condition in some combo decks. Eldrazi Temple as a multi-deck staple? Yep. 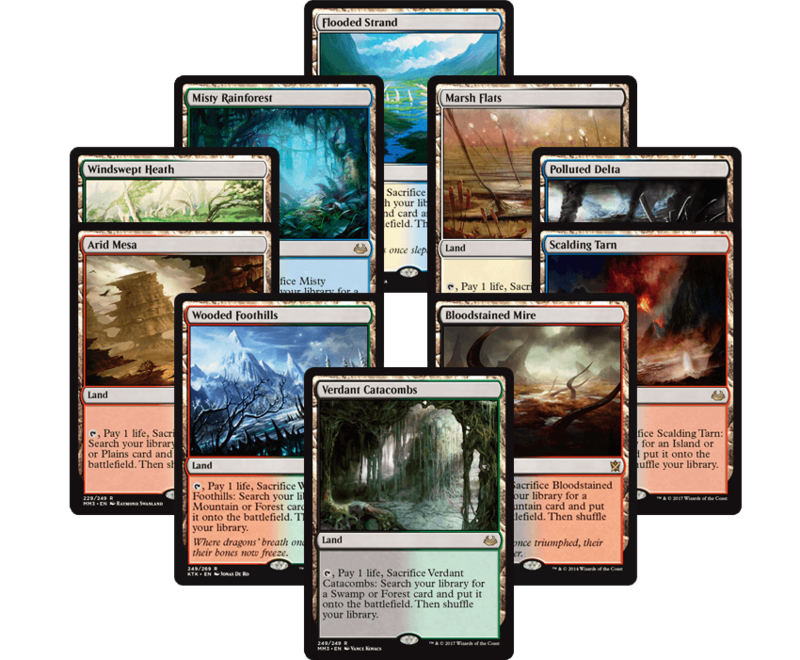 The format has several good Eldrazi decks—some of which are very different from each other—and they each need a full complement of Temples. 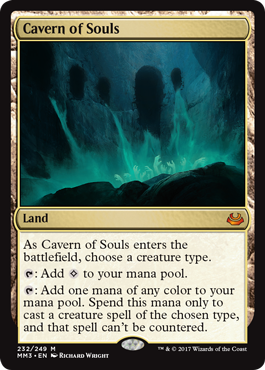 Any deck with a solid tribal component should at least consider Cavern of Souls. That includes all the aforementioned Eldrazi decks along with Elves, Merfolk, and more. And that's the list! I could have easily included another several dozen cards, covering everything from Darksteel's Æther Vial to Eldritch Moon's Collective Brutality. But you have to start somewhere, and the good thing about building decks in an Eternal format is that you don't have to collect everything all at once. Relax, take your time, and enjoy the hunt. See you at the next Modern Grand Prix!